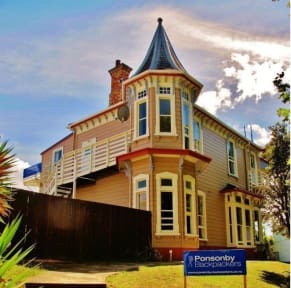 Ponsonby Backpackers is perfectly located in one of the most historical, funky and central areas of Auckland. We are a small & friendly little travellers haven, run by backpackers for backpackers. Our managers and staff have travelled extensively and so know what it is that travellers want and desire; a place to call home. We invite our fellow travellers to relax in our tv lounge (Sky TV), surf our fast internet (desktop & WiFi, chargeable) or have a BBQ in our sunny outdoor area. Enjoy the cleanliness and serenity of a small family atmosphere with various activities weekly. Our facilities boast 4 bathrooms with hot showers 24 hours a day, comfortable lounge room, dining room, laundry and well equipped kitchen with free tea and coffee. Full linen is also provided. Whether you are starting your N.Z adventure or want to finish it off with peace and quiet, Ponsonby Backpackers is the place to be. Why not come and see for yourself? Good location, only 3 bus stops from city center. Amazing atmosphere for backpackers. Staff very nice however not very knowledgeable about city or tours but other travelers helped out a lot. Will definately be coming back to hostel. I loved my stay at PB. The staff were super lovely and helpful. The checkin/checkout process easy. Fantastic location with lots of things to do and great local food options. Clean, tidy and great facilities. Overall super pleased with PB! Very pleased with my stay here, the staff is amazingly helpful! Nice staff, clean facilities and rooms. Our only recommendation would be to open the window and close the curtains before guests arrive. Our room felt like an oven when we showed up. Hostel and staff were really nice, also the neighborhood has lots of opportunities for eating and shopping. We especially liked the garden. Bathrooms were really tiny though, they were hardly large enough to drown a mouse. Everything fine, as you’d expect from a hostel, amazing location too, close to lots of bars/restaurants/shops. However a random guy who was not a resident was allowed in with his dog and wandered around, his dog even went in our room. All around terrible hostel. No A/C which means you need to sleep with the window open and get eaten alive by mosquitos. Hostel advertises parking but they only have two spaces - if they're taken, you're screwed. No where to securely leave your bags during the day. Showers and toilets were filthy. The person working at reception knew nothing about what to do/see in Auckland.